Misti McKeehen has no way of knowing what the future holds, but civic engagement, leadership with a global mission and a passion for the nonprofit community will remain at her core. 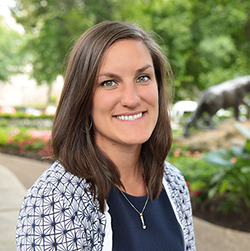 Recently named as one of "20 people building a better Pittsburgh" by The Incline, McKeehen graduated from Duquesne in 2013 with a Master of Science degree in Community Leadership. As director of PittServes at the University of Pittsburgh, she oversees a department focused on student community service, leading to more than 400,000 service hours per year with more than 300 community partners. "When I was looking at graduate schools, I saw Duquesne and its mission of service. I have a passion for nonprofit work and am interested in looking at a community as a whole," McKeehen said. "The diversity of the classes, looking at things like community assets and conflict resolution makes Duquesne different." Her current role at the University of Pittsburgh focuses on helping students find their passion as they step off campus and into the community, as well as building connections between the University and its surrounding neighborhoods. Her specific responsibilities include strategic planning for the Pitt Pantry, the student-run campus thrift store; the Student Office of Sustainability; Pitt's Make a Difference Day; and International Alternative Break Service. She is also the staff advisor to the National Society of Leadership and Success, Strong Women Strong Girls, and Alpha Phi Omega, a national service fraternity. She previously served as site director for Public Allies Pittsburgh, a program that offers opportunities for talented and diverse young leaders to emerge in communities across Southwestern Pennsylvania. McKeehen also is a member of the Clean Pittsburgh Commission, on the board of advisors for Collegiate YMCA and on the Next Gen committee of United Way of Southwestern Pennsylvania. She holds an undergraduate degree from Carlow University and is currently pursuing a Doctorate of Education at the University of Pittsburgh.